“Go to Lake Bohinen, it’s better, and fewer tourists,” said the waiter, while he poured more wine. We knew he was right, because even though Bled is a tourist magnet with its beautiful villas, churches and castles, lake Bohinj has a spectacular scenery and is half as commercial as Bled. And nothing is more boring than the commercialization we so often experience, I therefore browsed guide books for something more. And this time I had luck with me – in one of Bled’s many hotels, I found something that caught my attention. 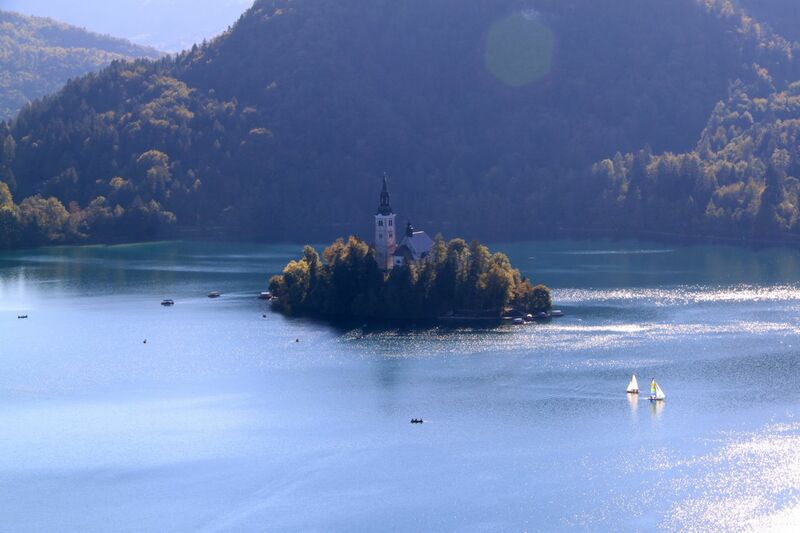 But in spite of commercialization, Bled remains one of Europe’s most beautiful places. The lake, Bled Castle, the island with its beautiful church, is like a fairytale. There are no annoying motor boats, so one experience a tranquility that automatically makes one slow down. The silence is interrupted only by the church bell on the island. Visitors to the church may ring the bell for good luck. So while walking around the lake and watching the beautiful suroundings, one can enjoy the sound of all the souls who hope for happiness.But my goal for this trip was something very different, and to get to “my attraction”, we had to go to the Hotel Villa Bled. My traveling companions was somewhat skeptical when we pulled into the driveway of the hotel. I had not told why we should stop at this hotel, therefore they agreed with some reluctance. Hotel Villa Bled was completed by Tito after World War II, but the first villa was built in 1883. King Alexander bought the place of Windischgrätz family in 1922, determined to build a new villa in flight with the old. But the King died in 1934 and the house demolished. The reconstruction of the new house was interrupted by World War II. But Tito demanded to finish the villa once the war was over, it became one of Tito’s favorite places. 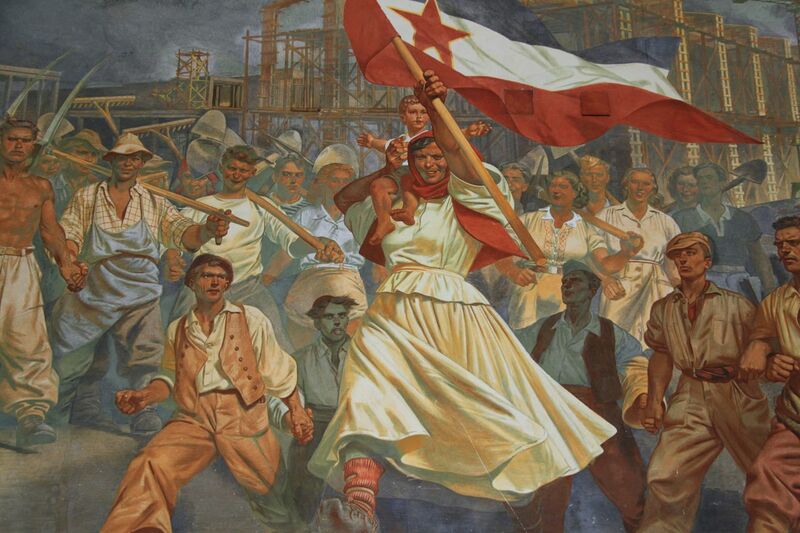 But Tito did not only rebuild the Vila Bled he also committed artist Pengov – and therefore one of the meeting room has a huge fresco that describes Yugoslavias struggle against the Nazis during World War II. It is this fresco that caught my attention! But it is not certain that you will be able to se this magnificent piece of art. Since the painting is in a meeting room in a hotel, it might be occupied or even worse it may be covered. Therefor I was a little nervous when I confronted the front desk. But the receptionist gave me access with great enthusiasm. The painting depicts air bombing of Belgrade, the battlefields of the Neretva, Sutjeska, Igmanski and ultimately victory over the Nazis and the rebuilding of the country. The fact that it is in a meeting room, and reflects postwar use of artists to portray the political attitudes and propaganda, make this interesting. The fresco is, however, covered with curtains if the room is used for weddings or other events intended that the painting theme is considered inappropriate. The fresco is considered part of national heritage of Slovenia, and therefore it can not be moved to a place more available for the public. In our artistic stop we did, like everyone else, and rented a boat rowed out to the island with the beautiful church of the assumption. After an hour off shore we drove to Bohinen just to check if the waiter was right, and that he was. But after seeing Pengovs fresco, and walked in Tito’s park, I admit that in spite of all the commercialization, Bled is beautiful, very beautiful.